Born: 25 October 1867, Adelaide, Eastern Cape, South Africa. 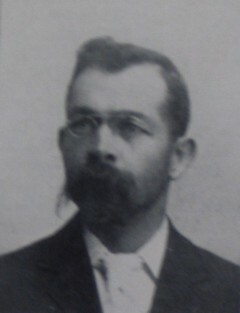 Ebenezer (Eben) Potgieter, son of Stephen J. Potgieter, was educated at Uitenhage. In 1885, when he was a young man of 18, he presented a large collection of land shells from Uitenhage to the Albany Museum, Grahamstown, as well as a rock lizard and two species of snakes. Potgieter married Rosalie M. Smith on 5 October 1898. By 1899 he was living in Wepener, in what is now the Free State, where he had set up business as an agent. A few years later his professional roles were listed as legal practitioner, conveyancer, sworn translator, sworn appraiser, and auctioneer. He was still in business in Wepener by 1915, trading with Thomas Harries under the name Felix Michalski and Company. After the death of his wife in 1913 he married Maria M. van Staden. Cape of Good Hope. Report of the committee of the Albany Museum, 1885. General directory of South Africa, 1903, 1908, 1911, 1916. National Automated Archival Information Retrieval System (NAAIRS). . Documents relating to Potgieter, Ebenezer / Potgieter, Eben.